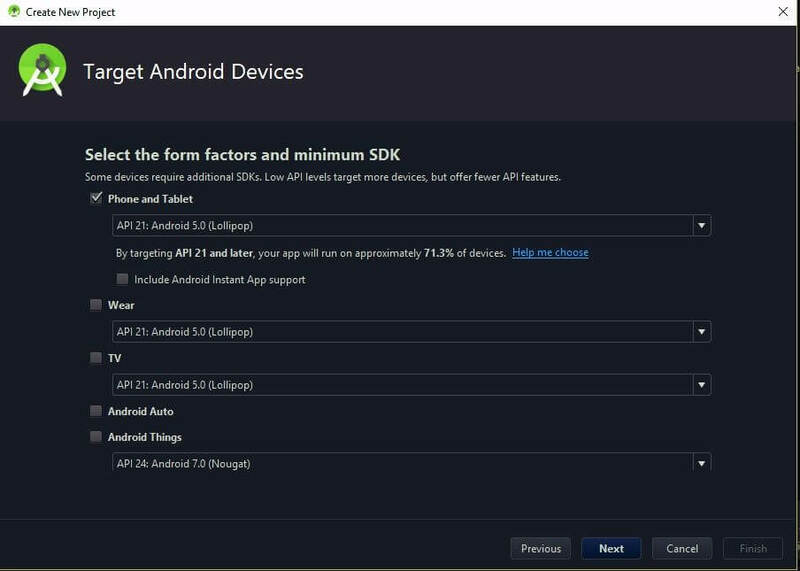 You will need Android Studio 3+ and Node.js installed on your machine. Some knowledge of Android development will be helpful. Often times we like to track and visualize our applications in a central place. Feeds are great for this! 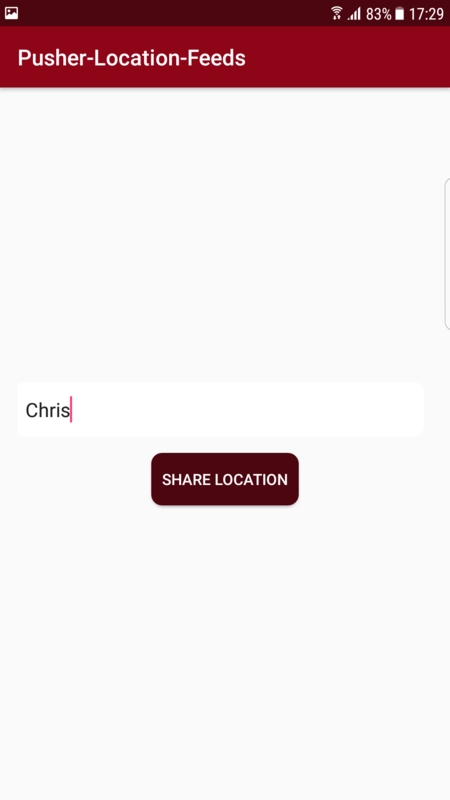 In this tutorial, we'll build an Android app with an activity feed that allows users to broadcast their locations and share with all other connected users in realtime. We’ll build the Android app to monitor the activities of a Node.js REST API. 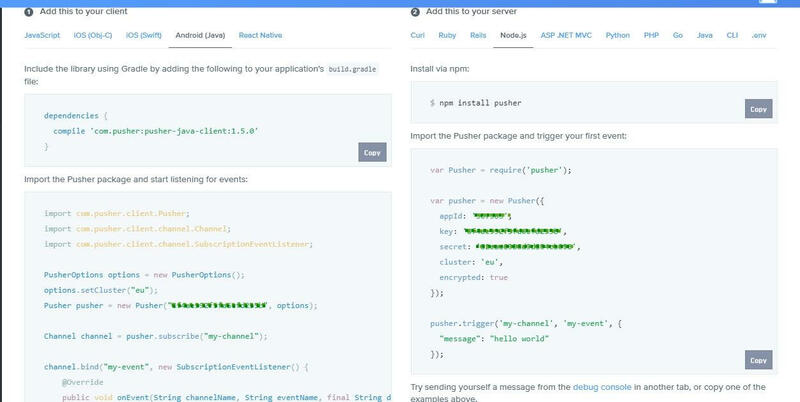 Every time the endpoint of the API is hit, Pusher will publish an event with some information (location shared by the user) to a channel. This event will be received in realtime, on all the connected Android devices. 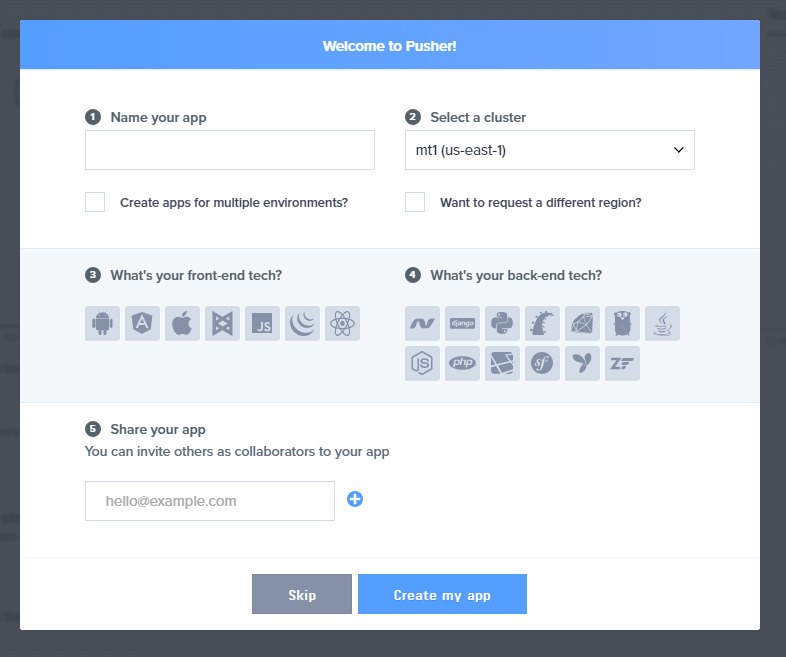 To follow along, you’ll need to sign up with Pusher and gain access to your dashboard to create a Pusher project. 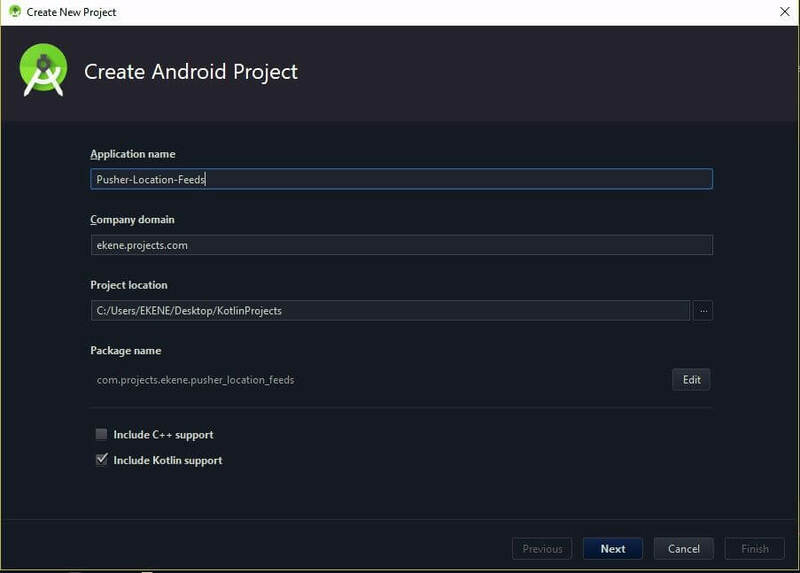 You will also need to have Android Studio v3+ installed to build the client part of this application. To build our server side script, you’ll need to download and install Node if you don’t already have it installed. Next, sync the project by clicking Sync Now with the gradle file to install the added dependencies. Here we have a simple LinearLayout with two view objects, an EditText input to collect the user’s username and a share button to send the location to the server. Here we are simply getting the value of the input we defined in the layout file and passing it into the MainActivity class with an intent . Once the user has entered a value (username) in the Edittext object, we set a listener on the button to call the intent action when clicked. This action will only execute if the input value is not empty. Next we define a layout where we’ll render the map locations of each user when they share their location. We’ll get their latitude and longitude coordinates along with the username they provided in the LoginActivity and send it to our server, which then returns a map of the location with the provided username on the map-marker and display it on screen for all users. Here we have defined an arrayList from our Model class that will be used by the adapter to populate the R``ecycler``V``iew. 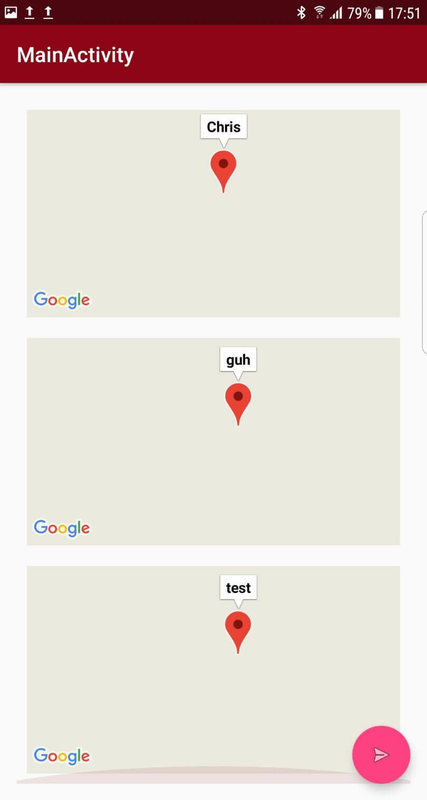 In the onBindViewHolder() method, we bind the locations coming from our server (as longitude and latitude) to the view holder we defined for it. We also passed the user’s username to the map marker. Then in the onCreateViewHolder() method we define the design of the layout for individual items on the list. Finally the addItem() method adds a new instance of our model class to the arrayList and refresh the list every time we get a new addition. The baseUrl we used here points to our local Node server running on your machine as shown above but we’ll get to that later on in the tutorial. For now let’s go back to MainActivity.kt and initialize the necessary objects and update it with the classes we’ve created above. Here we’ve just initialized the objects we’ll need, our Adapter class, Pusher, location request and the fusedLocationClient. With the fusedLocationClient object we initialized earlier, we are getting the user’s location. If we succeed in getting the location, we pass the the longitude and latitude along with the user’s username into our body object. We then use it to build our HTTP request with the jsonObjects as our request parameters. Here we simply pass in our Pusher configs to the Pusher object and subscribe to the feed channel to listen for location events. Then we get the data returned from the server into our defined variables and pass them to our model class to update the adapter. Then go to the App Keys tab and copy your app_id, key, and secret credentials, we'll need them later. If that is not the case, Download and Install Node. As we described earlier, we’ll use Pusher to publish events that happen in our application. These events have an eventChannel, which allows them to relate to a particular topic, an eventName that is used to identify the type of the event, and a *payload*, which you can attach any additional information to and send back to the client. In our case, we’ll publish an event to a Pusher channel (“feed”) when the endpoint of our API is called. Then send the information as an attachment so we can show it in an activity feed on the client side. Once the server is live, go ahead and run the Android app. To run the app, keep your system connected to the internet. Back in Android Studio, click the green play icon on the menu bar to run the application or select Run from the menu and click Run ‘app’ from the dropdown. 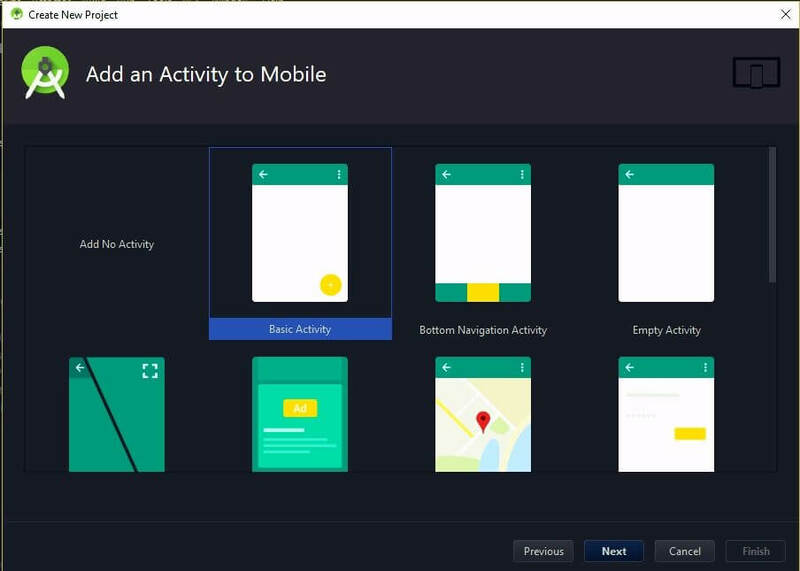 This action will launch your device modal for you to see all connected devices and emulators. If you’re using a physical device, simply select your device from the list of available devices shown and click OK.
On the devices modal, select Create New Virtual Device. This will launch a hardware selection modal where you will select any device of your choice for instance ( Nexus 5) and click Next. This will launch another modal where you will select the API level you will like to run on the device. Your can choose any of the available options for you or stick with the default and select API level 25. Click Next again to give your emulator a custom name and then click Finish to complete the setup. Now when you run the app again, you will see your emulator listed on the available devices modal. With your system still connected to the internet, select your preferred device and click Ok to run. 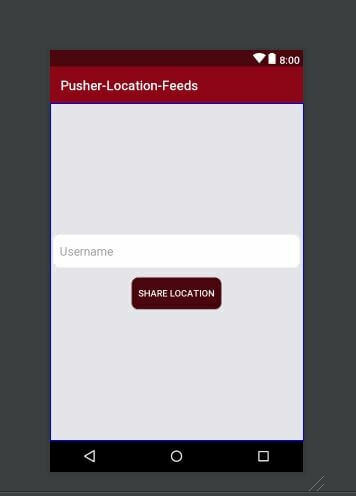 Hopefully, this tutorial has shown you in an easy way, how to build an activity feed for Android apps with Pusher. As you continue to build stuff, Perhaps you’ll see for yourself that realtime updates are of great importance. When you do, Pusher has all you’ll need to get pushing. Project is available on Github and the server side code also available on this gist.